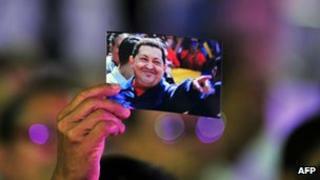 The Venezuelan government says President Hugo Chavez has suffered a respiratory infection but his condition is stable. Mr Chavez, 58, is in Cuba recovering from cancer surgery, his fourth such operation since last year. Communications Minister Ernesto Villegas said the infection had been controlled, but that Mr Chavez had been told to rest. He is due to be sworn on 10 January for a fourth term in office. Mr Villegas said that the medical team treating Mr Chavez in Cuba had ordered "total rest for the next days and strict adherence to the prescribed medical treatment in order to maintain Mr Chavez's current vital functions". Mr Chavez, who has been in power since 1999, won another six-year term in October's presidential election. Mr Chavez has said Venezuelans should vote for Vice-President Nicolas Maduro in fresh elections, should his health fail.